This year’s annual Learning and Teaching Conference saw a range of students, academic and support staff come together from across the University to showcase their innovative practice. This year’s conference theme, Stepping up Students Learning, aimed to showcase and celebrate the areas of best practice in teaching and learning happening at Aberystwyth. Hot off the heels from recent accolades for the University, including being named University of the Year for Teaching Quality and also achieving TEF Gold, there has been much innovative practice to celebrate and share. One of the strengths of the conference is providing a space in which colleagues can come together and discuss their learning and teaching. This year’s keynote was given by Professor Jonathan Shaw from Coventry University’s Disruptive Media Learning Lab. Jonathan discussed how the lab focuses on mainstream and alternative approaches to using technology to foster amore hybrid and open approach to teaching and learning. In addition to the keynote, two of Jonathan’s colleagues, Oliver Wood and Thamu Dube, offered workshops to conference participants. Oliver’s workshop focused on LEGO as a teaching tool – participants were tasked with using the LEGO to discuss ideas. 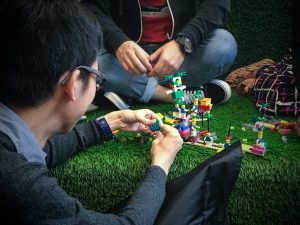 Colleagues were equipped with strategies as to how they could use LEGO in the classroom as part of a learning activity. The LEGO is now available in loan stock. If you wish to make a booking for the LEGO, email is@aber.ac.uk with your requirements. Recordings from the conference will be available on our webpages so if you missed a session, or you’d like to hear more about a particular topic, click here. We will begin organising next year’s annual learning and teaching conference shortly. If you’d like to propose an idea or suggest a keynote, then get in touch with us (elearning@aber.ac.uk). This entry was posted in Conference, Events and Networks, Other Tools by James Woolley [jbw]. Bookmark the permalink.